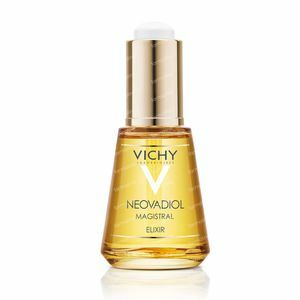 Vichy Neovadiol Magistral Elixir 30 ml order online. A Vichy innovation is the exceptional complex of oils rich in omega's 6-9. They nourish and soften the skin, make the skin radiant once more and gives a long lasting sensation of comfort. Suitable for sensitive and menopausal skin, dermatologically tested and without any parabens. The exceptional light oil has a dry touch effect after application, feels like satin and non sticky nor a shiny finish. -A nourishing and repairing elixir rich in omega 6-9 oils to deeply repair and comfort skin. -This elixir is suitable for mature skin that has become vulnerable after the menopause. Loss of skin density aggravated by intense dryness and a dull complexion. -As a serum: apply a few drops onto the skin before using your daily creams. -Add a few drops to your regular moisturizers to really boost the hydration effects. -Let 10 drops sink into the skin like you would a mask. CAPRYLIC/CAPRIC TRIGLYCERIDE, DICAPRYLYL CARBONATE, BUTYROSPERMUM PARKII BUTTER/SHEA BUTTER, ORYZA SATIVA BRAN OIL/RICE BRAN OIL, CARTHAMUS TINCTORIUS OIL/SAFFLOWER SEED OIL, BHT, TOCOPHEROL, CAPSICUM ANNUUM EXTRACT/CAPSICUM ANNUUM FRUIT EXTRACT, PARFUM (FRAGRANCE).